Welcome to the Hackney Flashers website! The Hackney Flashers, a women’s photography collective, was formed in 1974 and remained active until 1980. It was started by a small group of photographers and an illustrator with the purpose of making a photography exhibition about women at work – part of a trade union event celebrating 75 years of union activity in Hackney, East London. The group eventually also included a designer, a writer and a book editor. Over time members described their individual political positions as feminist or socialist feminist. Between 1974 and 1980 the Hackney Flashers produced two exhibitions of photographs and cartoons focussing on two key areas of women’s lives: paid work, and the lack of childcare for working mothers. 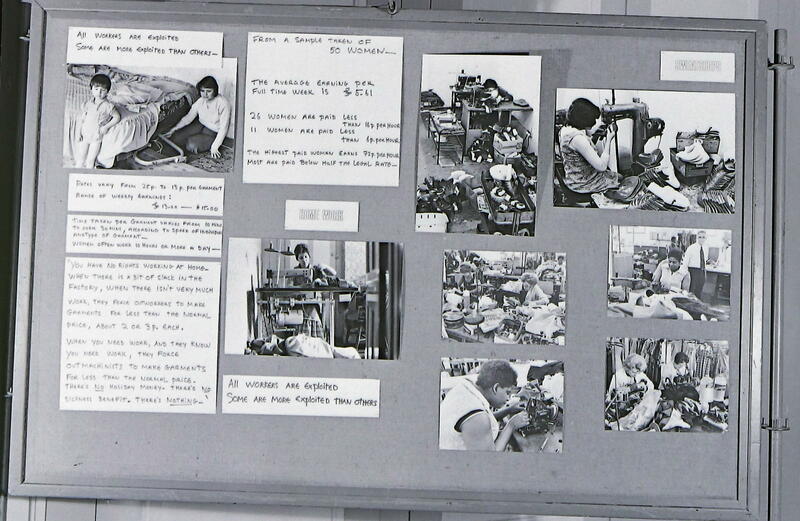 These exhibitions, ‘Women and Work‘ (1975) and ‘Who’s Holding the Baby?‘ (1978), were intended first and foremost as agitprop – to raise consciousness about the issues involved and support relevant action. They were shown in community settings like health and community centers and libraries and in political contexts such as women’s movement meetings and trade-union conferences. The Hackney Flashers collective developed within the context of the rapidly growing Women’s Liberation Movement which believed, along with the political Left, that collective action was a vital element in bringing about social and political change. In 1979 ‘Who’s Holding the Baby?’ was shown in the Hayward Gallery’s first photography exhibition, Three Perspectives on Photography as an example of socialist photographic practice. Over the last ten years members of the Hackney Flashers have been contacted by an increasing number of young women, and some men, researching political and cultural activism in the 1970s. Their interest reminds us that the work we produced over 30 years ago remains as relevant today. Despite some advances over the decades, the need for good affordable childcare is as pressing now as it was in the 1970s. Women’s position in work has also changed very little. The purpose of this website is to record our work so that it may contribute to the ongoing struggle for adequate childcare and equality for women. ‘Who’s Holding the Baby?’ can be seen at the Reina Sofía Museum in Madrid and online on their website. A more detailed history of the group is available here.